How to Easily Master Format ASUS ZENPAD 3S 10 Z500KL with Safety Hard Reset? Tips and tricks to fix ASUS ZENPAD 3S 10 Z500KL trouble. This is 9.7 inches tablet using Android Marshmallow operating system when the first time release in the market. This tablet have two options for single or dual simcard slot network provider. All games will like to use ASUS ZENPAD 3S 10 Z500KL because this tablet have dedicated GPU Adreno 510 and big internal memory 32 GB and 4 GB RAM for multitasking applications. Find more information about how to solve ASUS ZENPAD 3S 10 Z500KL trouble at www.hard-reset.org community. The ASUS ZENPAD 3S 10 Z500KL will continue the step until ready to use in clean factory default. 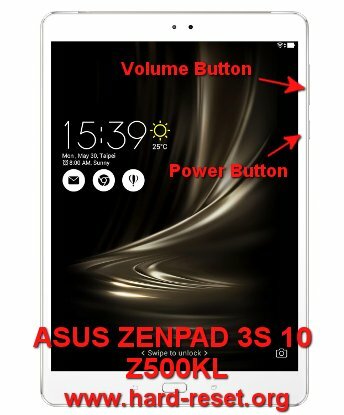 How to Make Battery of ASUS ZENPAD 3S 10 Z500KL Stronger, Life Longer and Not Fast to Drain ? For almost 10 inches LCD screen at ASUS ZENPAD 3S 10 Z500KL tablet, using 7800 mAh battery is good enough for make this tablet can work almost one day. But we have to know that LCD screen is the most battery drain function. Therefore if we want to work longer using ASUS ZENPAD 3S 10 Z500KL then please reduce LCD screen brightness as low as possible. This is very important to make this tablet battery not fast to drain when we watch movie or playing games for several hours. How to Easily Master Format HUAWEI Y3II / Y3 2 with Safety Hard Reset?